Episode 35 - It's deja-vu all over again, as the Pandavas move from the hermitage of Nar-Narayan to another one on the slopes of Mt Kailash, named for Arstisena. Another flower wafts down the hill, and Draupadi again sends Bhima off in search of the source. Bhima completely forgets Yuddistira's injunction about making trouble and he invades Kubera's kingdom, starting a war with the god's "genial leprechaun" army. There's no Hanuman this time around, but we do at least get an explanation for Kubera's toleration of Bhima's vandalism and slaughter-- it turns out that Kubera's buddy Manimat had been cursed by Agastya, and was doomed to die at the hands of a mortal. Bhima was only fulfilling the inevitable. During the course of this adventure, the fifth year of Arjun's mission comes to an end. 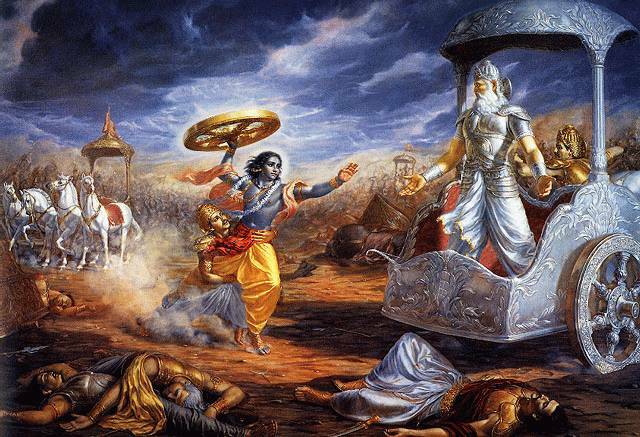 He comes flying in on Indra's chariot, with a load of WMD in the back. After a joyful reunion, Arjun tells us of his last mission for Indra. This story is another replay. It is basically the same story as Krishna's battle with Shalva and his Saubha "flying city". This time the flying city is inhabited by Nivatakavacas ("beings clad in air-tight armor"), and Arjun fights them to the death, breaking in his new weapons. Now re-united, the brothers hang out in the gardens of the far north for another four years, making it a total of 10 years they have spent so far in exile. Next time, they will begin heading south and making preparations for their year in hiding.